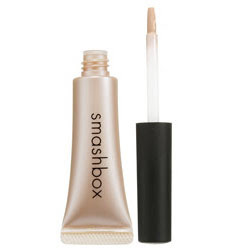 If you've been similarly busy and the activity of sleeping has become "optional" in your ever growing list of priorities, you might be tempted to try Smashbox's new Photo Op Under Eye Brightener. Smashbox make up artists have apparently raved about this... saying that it's a photoshoot staple, and that it almost eliminates the need for concealer. And given Smashbox's primo status as the Reigning Producer Of All Things Primer, I couldn't resist buying the little tube. Sadly, my sleep-deprived friends, Photo Op was a total bust. If this eliminates the need for concealer for you, then you probably didn't need much concealing in the first place. This slightly shimmery apricot-tinged liquid is far too thin and non-pigmented to do any good. It does add a slight gleam or reflectiveness to the under-eye area, but it doesn't really aid in the concealing. I've used this both under and over concealer, and still... nada. The only thing Photo Op does well is make the undereye area feel nice and smooth. So, if you have a great concealer that just doesn't blend well enough, you might find this product helpful. But if you're looking to actually conceal/brighten, just go pick up Maybelline's Age Rewind from the drugstore. It's got both a concealing end and a highlighting end. And while Age Rewind doesn't feel quite as nice, it at least does something. Oh, and it's also less than half the price! If, like me, you are now stuck with this stuff, one thing I have found that helps it go on more potently is to use the slightly dried product that collects in the threads of the screw-on top. (Helpfully, the tube gets a bit messy/leaky over time.) The drier product gives a bit more coverage. Still not anywhere near sufficient to conceal circles, but it helps a bit. You can also dot it on your undereye area and let it sit for a bit before you start blending for a similar effect. Or you could just use it as a nice highlighter. A nice, tiny, $20 tube of highlighter.